There’s only one chance for a first impression, and your home’s front hall will be the first thing your guests see. Thick garlands of evergreen spiraling down a grand banister or a fresh bouquet of amaryllis waiting by the front door greet your guests with the warmest of welcomes. Read on for more decoration inspiration. Walnut double doors stand out against the white clapboard home. They are especially striking at Christmastime, framed by a snow-covered garland and candy cane accents. Fresh greenery is entwined with pinecones of various sizes, pheasant feathers, and green ribbon on the stairway in this entry. Festive red is found in accents on the center table. Sometimes simple is best. Shrubs, wreaths, and garlands, naked but for the plain white Christmas lights, twinkle in the night outside the red brick home. Step inside this home on the next slide. With a lighted garland guiding the eye upstairs and a direct view of the Christmas tree, the spirit of Christmas immediately greets guests as they step into this two-story foyer. Garlands tied with gorgeous golden bows drape the banister in this gracious entryway, while wrapped gifts placed on the bench reference the light shades of blue found throughout the house. A gorgeous garland generously adorns the banister from the entry all the way to the second floor landing. Silver ribbon entwined throughout complements the sparkling chandelier and the cool silver-gray stair runner. Dotted with silver foliage, green garlands trace the railings in this foyer staircase. A basket of white poinsettias warms the fresh greenery. See more of this Scandinavian home here. In this Chicago home, crisp white paint plays up the architectural features for an undeniably elegant effect. Chocolate brown and dusty lavender details play up the drama, while holiday décor­­–like the Santa standing watch at the base of a garland-wrapped banister. Tour the rest of this gorgeous Chicago home. Here holiday décor mixes and mingles with the homeowners’ collection of antiques from their travels in this foyer. Artichokes tied with silver ribbon and dainty periwinkle blooms add a unique twist on the banister garland. See more of this home on the following slide. Reclaimed ceramic pavers lead guests in from the cold to this spacious side entry. Wrapped gifts pile up on the antique Gustavian bench, which features under-seat storage for extra convenience during this busy season. Check out the rest of this gorgeous home in hushed neutrals. This Holiday House Designers Showhouse entry wows with arched doorways, polished marble floors, and an abundance of lush, fruity garlands. Created by Benjamin Bradley and David Thiergartner, the Christmas-inspired room comes to life with citrusy tones and olive greens against warm neutrals. This entry gives a warm welcome to visitors with its earthy palette and still life-like décor. A folk art painting hangs behind a English oysterwood chest, while a brass watering can from Huntington and Hope holds fresh blooms. See more of this entry on the following slide. Banisters are bedecked in garlands of magnolia, boxwood, and fir, wrapped in shiny black ribbon. A faux-zebra-covered fauteuil lends contrast and a little humor. Tour the rest of this cozy Connecticut home. Here, a grouping of pinecones tied with bright ribbon cap off a banister garland. A grand staircase is the main event in this spacious foyer. Seasonal greens cascade down the curved banister and wrap around the newel post, which is topped with a decorative seeded glass ball. The Christmas tree is tucked into the curvature of the staircase; a nuanced wool-and-silk runner guides the stairs down to the honed French limestone floor. Magnolia leaves, pears, and copper-colored glass balls create a masculine garland for a wooden door. The ornaments’ diffused sheen makes the arrangement glow, while pinecones add texture. See more from this home on the following slides. A group of shapely potted topiaries add a little humor to this side table. Small luminescent ornaments pepper the greenery for color. Even the horse statue gets into the spirit with a small wreath around its neck. Festive golden ribbon around the newel post matches the sunny hue of the stair runner. In this sunny mudroom serving as an entry into a festive home. country casual decorations are subtle, like the pine boughs tied with raffia down the banister. A Windsor bench with a plaid seat softens the brick floor. See more from this colorful Massachusetts Colonial here. Bright red ribbons twirl around a green garland dotted with lemons for a merry effect. An oversized gilded mirror serves as backdrop for this elegant foyer. White candles twinkle against the gold frame and ornamental holiday statues. Paperwhites and red berry branches make a lovely entry display. Pinecones pop against this pine garland, complemented by the red-and-green plaid ribbon. Small white lights twinkle merrily from within the arrangement. Potted poinsettias line the hallway, guiding guests to the back entrance. This mudroom is casually decorated with a pair of classic nutcrackers and simple evergreen details, like boughs and berries draped over the family’s chalkboard schedule. An urn filled with fruit, flowers, and branches adds height in the foyer. “Fruit-on-fruit” layering is his decorating technique, says floral designer John R. Roberts. Here, he edged a bouquet of Protea foliage and green cymbidium orchids with tangerines and cranberries. The stair railing is swagged with a garland of boxwood and evergreens. Floral designer John R. Roberts topped a newel post with a ball of key limes and cranberries. He attached the fruits to a 3-inch foam ball using heavy-duty floral picks. 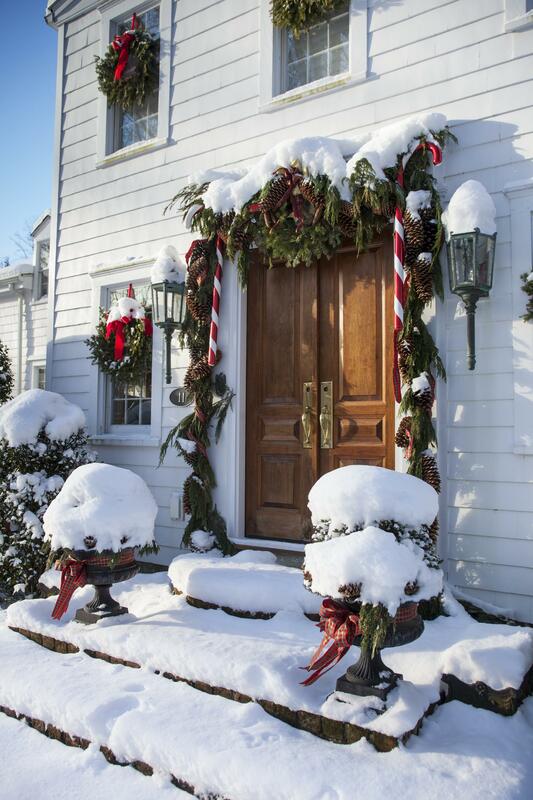 A classic six-panel door welcomes visitors with merry chimes from a string of antique sleigh bells. A limestone-and-iron spiral staircase looks striking when dressed in holiday garlands. This dramatic entry hall features a marble floor, sweeping staircase, and gilt dome. Magnolia leaves add a hint of Southern charm; a round pedestal table adds dimension to the space. Architectural paper lanterns lit by votives illuminate and decorate the stair risers for a cozy effect. The lanterns can also be used as table centerpieces or garden lanterns. See more from designer Gregory Van Boven’s home on the following slide. Standing on a marble-topped demilune table in the foyer, a vivid red amaryllis and an elegant Nymphenburg porcelain stag make a double impact with their reflections in a gilded mirror. In this contemporary front hall, holiday décor is kept to a minimum to complement the home’s modern aesthetic. Bare branches are tucked into a tall glass vase filled with silver marbles for a wintry look. Small glass snowflakes hang from the branches for a bit of sparkle and glamour. Artwork is by Catharine Warren. A garland of magnolias, cedar boughs, and lavender thistle winds down this banister, infusing the gorgeous display with fragrance and twinkling lights. An 18th-century putto statue stands amid greenery in a niche. This round foyer table is topped with natural elements like pomegranates, pinecones, paperwhites, and mini pine trees. Bunches of cinnamon sticks and large jars of candy add sweet color to the display. An entry display can be the perfect spot for special mementoes. This carved German nativity scene is a family heirloom. In a formal entry hall, two large vases hold a colorful assortment of winter greenery and fruits; the large painting and high ceilings keep the scale of the hall consistent. See more from Blair House on the following slides. An oversized wreath is dotted with apples, lemons, nuts, Hypericum berries, and osage oranges. Thick turquoise ribbon holds the beautiful display to the window, where it can be enjoyed from indoors and out. Pomanders are a very traditional treat, their history going back to medieval times when they were used to ward off diseases. They take on a decidedly merrier tone as holiday décor: The banister’s lush garland has fragrant fruits that lend color to the display. The entry hall’s greenery is complemented by the warm wood of the credenza. Gilded berries dotting the garland echo the hall’s gilded picture frames and sconces. An elegant two-toned ribbon ties together the home’s silver-and-gold holiday motif. Small touches can add cheer to an already-decorated foyer. Here, fragrant satchels and a miniature Christmas tree decked out in ribbons and pinecones adhere to the scale of a white bust and side lamp. Hungry for more holiday decorating tips? Click here to see advice from Chicago’s award-winning firm Mariani Landscape on how to give your home’s landscape a festive look for the season.